Dutch chef Sergio Herman, start of Belgian TV food programmes and owner of the Michelin-star The Jane in Antwerp, plans to open one of his gourmet chips outlets in Brussels. 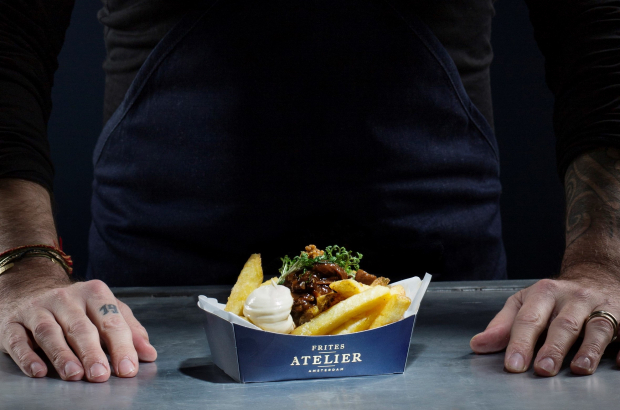 Herman opened a Frites Atelier outlets in Antwerp last year, following three in the Netherlands. One is expected in downtown Ghent this summer. The Brussels location will follow sometime in the autumn. Unlike the average friture, Frites Atelier has a sophisticated interior of hardwood and marble, and the fries are special, too. Customers can pick from homeade ketchup or mayonnaise or one of five special sauces – basil, truffle, andalouse, Thai and béarnaise. There are also gourmet toppings like Indo peanut sauce, Flemish stew and a fiery kimchi special. A pack of chips start at €3.50, while “pimped up” versions stretch to a hefty €8.50. Herman spent 18 months perfecting his fries before opening his first outlets, using Zeeland potatoes baked in a blend of 100% natural oils before being fried and flavoured with samphire salt. The Brussels Frites Atelier will be located on Rue Sainte-Catherine in the former premises of Jack O’Shea, the Irish butcher hugely popular with expats until it closed its doors in 2016.